The Canadian Opera Company has been slogging through Wagner’s interminable Ring Cycle over the past three seasons. And I’ve been slogging through my reviews of said marathons of melancholy Germans singing about dwarves. The summary was always the same: the set is bonkers but impressive, the singers and orchestra are technically sound, no one is bothering to act, this story is stupid, I hate Wagner. Every single time. Then I would write about whatever Mozart piece artistic director Alexander Neef charitably paired with the Ring Cycle episode du jour and point out how said digestible comedy was almost always more dynamically staged and emotionally involving than the Wagner. Well, ladies and gentlemen, it’s a new world out there and I have thrilling news for you- the COC’s current episode of the Ring Cycle, Götterdämmerung, is great! Well, it’s good. I liked it, anyway. In related opposite-world news, I didn’t like the Mozart. (Scaled down with a so-so cast, no performance energy, and basically zero grandeur and/or magic is not how I want my Magic Flute). The final episode of the Ring Cycle, Götterdämmerung starts slow with a dull trio of overdramatic women recapping the story thus far. The most important thing to keep in mind if you share my taste in storytelling and want to like Götterdämmerung is that nothing that has come before really matters at all. Ignore the lady trio because 98% of what doesn’t work in this opera is weird mythology nonsense as recapped by these three with their ugly wigs and metaphorical rope props (they’re at the top of the show, the start of act three, and the very end- totally ignorable). Once the trio departs, with the exception of yet another “previously on Wagner” segment in act three wherein our “hero” tells his dwarf story (again), Götterdämmerung moves on, grows up, and discovers the sort of honest humanity that makes any story worthwhile. Passing familiarity with earlier Ring Cycle scores (and/or Star Wars) informs some of the recurring themes in the music (played with particular verve by the killer COC orchestra under the baton of ever-enthusiastic music director Johannes Debus) but the heart of Götterdämmerung stands on its own as one cohesive and complete 5.5 hour piece (it’s actually just over 4 hours but the COC’s built in a full hour’s worth of intermissions plus time for that inevitable standing o). Director Tim Albery has pulled the action down to earth and forward to the present where the COC’s thundering male chorus resembles traders at war on Wall Street and the romantic machinations of Gutrune and Gunther (Ileana Montalbetti and Martin Gantner, both complex and wonderful) are informed by upper class pressures juxtaposed with the earthy single-bedroom true love of a loose-haired Brünnhilde and leather jacket-clad Siegfried (Chrstine Goerke and Andreas Schager, forging the highest stakes of the cycle with a single prologue scene that establishes their relationship as something worth fighting for). 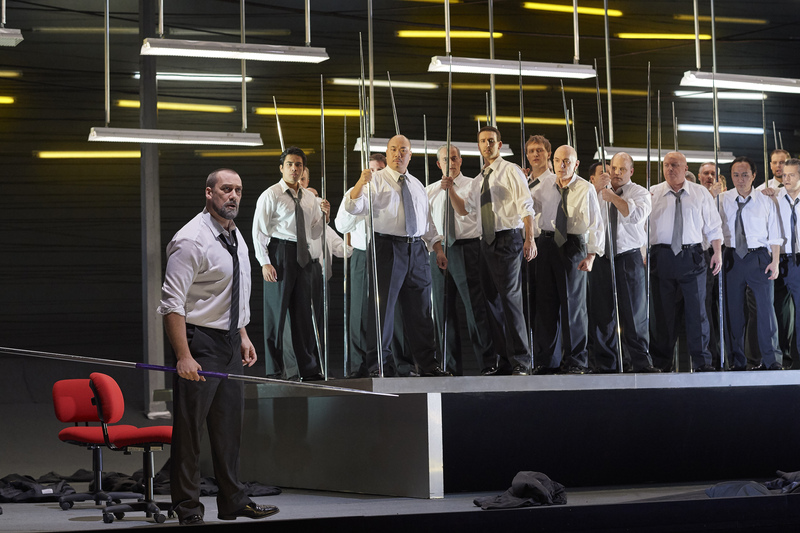 Estonia’s perfectly named Ain Anger is tasked with the lynchpin role of plot-moving vengeful villain Hagen in his COC debut and it’s his seductive bass and enigmatic internal conflict that gives the production its dramatic drive. It took nearly 15 hours to get here (for some reason the COC started with episode 2; the full thing would have been even longer) but I think maybe I like Wagner? At the very least, I like Anger and Goerke and Schager and Montalbetti and Gantner and Debus and Albery and Michael Levine (whose black costumes are cold, pristine and glorious) and David Finn (whose lighting design is stark, brash and impactful) and that’s a lot.